Coffeepot Stables' 2-year-old filly Liora – the longest shot in the field of eight 2-year-old fillies at odds of 27-1 – led every step of the way and narrowly repelled a late bid by odds-on 3-5 favorite and Breeders' Cup Juvenile Fillies (Grade I) runner-up Restless Rider to win Saturday's 75th running of the $200,000 Golden Rod (Grade II) at Churchill Downs by a scant nose. Liora, who ran 1 1/16 miles over a “muddy” track in 1:46.25, collected the $120,280 first prize and 10 points as part of the 30-race “Road to the Kentucky Oaks” series, which offers points on a scale of 10-4-2-1 to the Top 4 finishers as a “Prep Season” race. Channing Hill rode the winner for trainer and father-in-law Wayne Catalano. Two years ago, the owners (Bob Cummings and Annette Bacola), trainer and jockey teamed to win the Golden Rod with Farrell, and Catalano also won the race in 2014 with West Coast Belle. Liora broke fastest of all from post No. 6, quickly moved to the rail and rattled off comfortable quarter-mile fractions of :24.81, :49.68 and 1:14.70 when New York invader Break Curfew was bothered at the start and decided to track the leader. Restless Rider, racing in the clear on the outside, commenced a move into contention on the far turn and drew even with the leader at the top of the stretch. But Liora was stubborn and refused to relinquish the lead as the two battled gamely in a long stretch drive. Prior to the Golden Rod, Liora broke her maiden in her third start on the Oct. 28 opening day “Stars of Tomorrow I” card at Churchill Downs with a nine-length romp as the 5-2 second choice. High Regard was another 2 ½ lengths back in third and was followed by Champagne Anyone, Gold Credit, Princess Causeway, Break Curfew and Reflect. Liora improved her record to 4-2-0-1—$176,580 and paid $56.80, $12.60 and $6.80. Restless Rider, ridden by Brian Hernandez Jr., paid $2.40 and $2.20. High Regard, under Corey Lanerie, returned $7.40 to show. Liora, a daughter of Candy Ride (ARG) out of the Giant's Causeway mare Giant Mover, was bred in Kentucky by Dell Ridge Farm LLC. 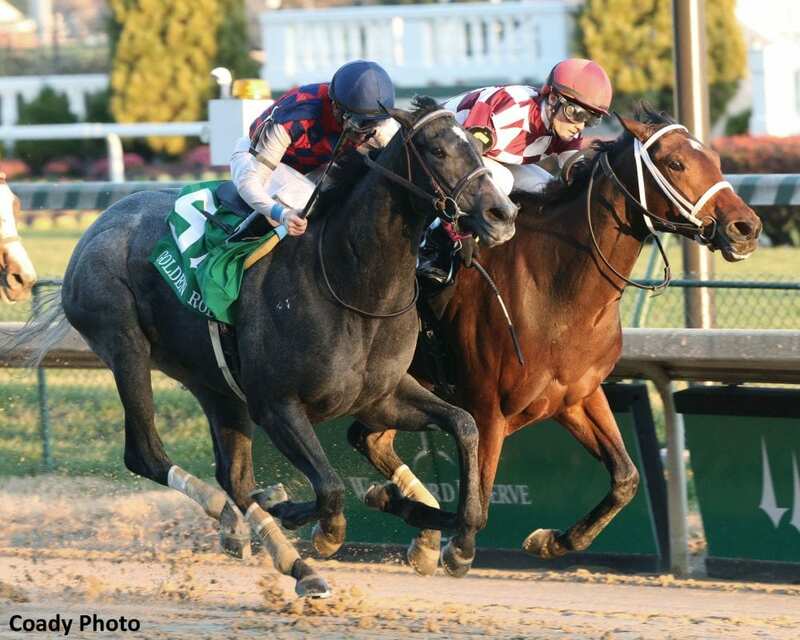 This entry was posted in Racing and tagged candy ride, channing hill, churchill, churchill downs, coffeepot stables, farrell, Golden Rod, kentucky oaks, liora, restless rider, Wayne Catalano by Press Release. Bookmark the permalink.